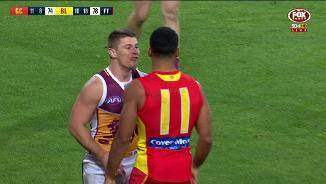 Is Zorko not a fan of Touk's breath? A strong contested mark from Stefan Martin seals the win for Brisbane. Martin was again important for the Lions with 13 hitouts to advantage, 21 disposals, five tackles and six score involvements. An excellent goal from a forward 50 stoppage by Jarryd Lyons keeps the Suns alive in the game. Gold Coast has now scored 4.3. (27) from such stoppages and only average 12 points from this source. A couple of set shot at goal misses now for Gold Coast after Brisbane has missed many opportunities. The Suns have recorded a shot at goal accuracy of only 40 percent this season (ranked last). Brisbane has had nine of the last 11 inside 50 entries and also had 63 percent time in forward half in the final quarter. 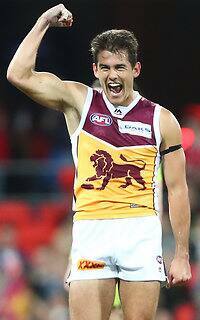 Three goals in a row to the Lions with Lewis Taylor converting another forward half intercept for Brisbane. The Lions have now scored 32 points from 24 such intercepts, while the Suns have scored 14 points from their 17 forward half intercepts. Gold Coast leads the contested possession count 2516 this quarter, and the clearances 9-6 with its midfield having a strong period. An important win in a oneon-one contest from Ryan Lester and fortunate assist led to the Beams goal. Brisbane now leads 9-6 in one-on-one contest wins, and Gold Coast is ranked second last at winning such contests this season. Brisbane leads 3730 in first possession wins at stoppages, but Gold Coast leads the clearance count 32-28 and scores from stoppages 5.3. (33) to 3.5.(23). Brisbane has now scored 4.2. (26) following free kicks or 50 metre penalties. 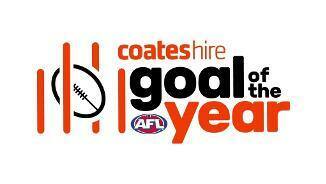 Gold Coast has scored 1.2. (8) from such opportunities. Another smart goal from Alex Sexton who has contributed a gamehigh four goals from an equal team-high seven score involvements. The last goal was sourced from a stoppage, and the Suns lead the clearances 5-1 this quarter. The centre bounce clearances are now 134 in favour of Gold Coast with this advantage providing the Suns with both two goals to nil and valuable territory. Aaron Young gets the opening goal of the final quarter following a forward half intercept by the Suns. Gold Coast has now scored 2.2. (14) from its 15 forward half intercepts. Gold Coast has been outscored by an average of 13 points in final quarter this season (ranked last), while Brisbane has won its final quarter by an average of three points (ranked seventh). The third quarter was even across most areas with the Suns able to take four marks in their forward 50, but only score one goal from set shots. The two teams have scored a combined 7.12. (54) from set shots at goal. A valuable late goal from defensive anchor Harris Andrews gives the Lions back the lead at three quarter time. Andrews has again been important disrupting opposition attacks with a gamehigh eight spoils, five intercept possessions and three tackles. Brisbane now has a return of 3.8. (26) from its set shots at goal, while Beams, Hipwood and McStay have now had a combined 11 shots at goal without converting any of these opportunities. Gold Coast has lost the inside 50 count by 14 per game this season (ranked last), but currently has its nose in front in this count (4039). Lions InterchangeNick Robertson off due to the blood rule. Brisbane has averaged 25 points from 21 forward half intercepts this season. Tonight the Lions have returned a wasteful 1.7. (13) from 18 such intercepts. Brisbane star Dayne Beams has a gamehigh 23 disposals, but has only recorded two effective kicks among these disposals. Gold Coast lead the tackle count 3660 and the also lead 5-2 in free kicks for holding the ball following the excellent run down tackle from Weller. The Suns have averaged 42.7 tackles per game away from a stoppage this season (ranked third). Gold Coast has now kicked the last three goals in the game, and eight of the last 11 goals following the strong mark and goal from Crossley. 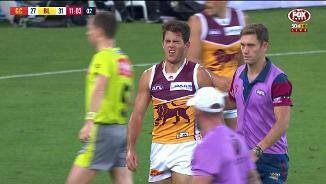 Another wasted chance for the Lions, this time from Daniel Rich following a strong forward 50 tackle. Brisbane has applied 11 such tackles (average nine per game), and Gold Coast has applied 12 forward 50 tackles (equal to its season average). A great start to the third quarter for the Suns with an opportunistic goal from classy forward Ben Ainsworth. This goal was sourced from a centre bounce clearance, where the Suns lead 94, and they have scored two goals to nil from this source. Dayne Zorko, who again has Touk Miller for company tonight, has a gamehigh five tackles and contributed four score involvements from his 11 disposals to half time. In the second quarter, the Suns conceded contested possessions (2938) and inside 50 entries (10-16) to the Lions, but were more effective in the forward half with five goals from these limited opportunities. Nick Holman has been a valuable recruit for the Suns this season, and his important late goal (one of his four score involvements) was sourced from a forward half stoppage. Gold Coast has now scored 2.2. (14) from seven forward half clearances. Brisbane is ranked third this season for percentage of defensive 50 rebounds directed through the corridor, with Gold Coast ranked second last in this measure. Tonight has followed script, with the Lions currently leading 6041 in corridor disposals. Stefan Martin provided the assist on the Walker goal, and the big Lion has again been prominent helping Brisbane to a 63 lead in hitouts to advantage. Brisbane has now returned a wasteful 2.5. 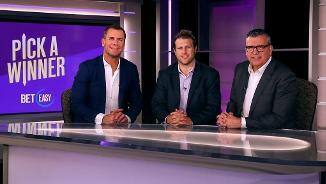 (17) from its set shots at goal, while key forwards Hipwood and McStay have not scored a goal from seven attempts combined. Jack Bowes continues to impress for the Suns with a strong tackle and accurate set shot at goal keeping Gold Coast very much in the game. The Suns have kicked four goals to two this quarter despite the Lions having double the inside 50 entries (147). A fantastic long range goal from Cam Rayner gives the Lions their third goal of the night from a forward half stoppage. Brisbane now leads 179 in shots at goal, but some errant kicking at goal has kept the margin to 12 points. Brisbane has taken a mark from 29 percent of kicks into the forward 50 this season by Dayne Zorko, which is ranked second of the top50 players to have kicked inside 50, and it was a kick from Zorko that set up Rayner for the last shot at goal. Brisbane now has an 114 lead in intercept marks, with the Suns continue to struggle with the connection between their midfielders and forwards. Lions InterchangeBrandon Starcevich off due to an injury. Alex Sexton is continuing to emerge as a scoreboard threat with his third goal of the game, and the better ball movement of the Suns this quarter is evident in their last two goals coming from defensive half chains. A good passage of play from the Suns following a defensive midfield intercept was capped with the Sexton goal. 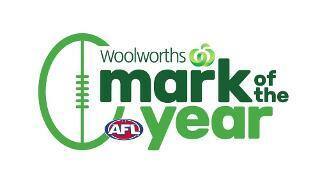 Gold Coast averages 10 points per game from this source. Eric Hipwood has recorded a shot at goal accuracy of 48 percent this season, which is the lowest percentage of the top20 goalkickers in the competition. Tonight the talented young Lion has missed his first three shots at goal. An excellent snap goal from Brayden Fiorini who has been prominent early for the Suns. Fiorini currently leads the Suns for both contested possessions (six) and disposals (11). An accurate set shot at goal from Rhys Mathieson following a free kick gives the Lions their first goal following a forward half intercept. Brisbane has now scored 1.3. (9) from eight such intercepts. While Gold Coast shaded Brisbane for contested possessions (4037) and inside 50 entries (19-13), the Lions were better with the ball recording more marks (29-14) and superior kicking efficiency (62 to 52 percent). A spectacular mark from Jack Bowes to end the first quarter. Bowes recorded careerhighs of 26 disposals, 18 uncontested possessions and 10 marks against Richmond last week. Luke Hodge has been influential in the opening quarter with gamehighs for both intercept possessions (five) and disposals (11). Brisbane has now scored 2.2. (14) from five forward half clearances. Gold Coast has not scored from either of its two forward half clearances. 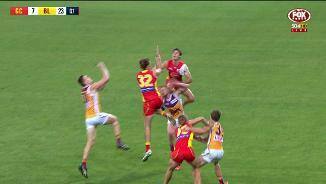 Alex Sexton finally kicks the first goal for the Suns after they had seven consecutive inside 50 entries. Sexton is the No.1 ranked Sun this season for both goals (24) and score assists (23). While Gold Coast leads the inside 50 count 1512, the Suns are yet to record an effective kick in this area of the ground. Lions InterchangeAlex Witherden and is possibly out for the game. The first score for Gold Coast was sourced from a forward half intercept. This season the Suns have scored from only 29 percent of these intercepts (ranked last) and average 19 points per game from this source (also ranked last). A first career goal for Brandon Starcevich following an excellent assist from Tom Cutler, and this time the goal was sourced from an intercept. Since Round 14, Brisbane has averaged 59 points per game from its intercepts (ranked fourth). A second goal to the Lions to come from a forward half stoppage, with both of these stoppages being throwins. Brisbane is ranked second in the competition for clearance differential at throw-ins this season. The first seven tackles of the game that the Lions applied were all in the forward 50. Brisbane average only nine such tackles per game this season. Brisbane already has a 40 lead in intercept marks. The Lions average only 12.6 such marks per game this season (ranked last). Brisbane has scored from 42 percent of its forward half clearances this season (ranked second), and this was the source for the opening goal of the game. The opening score of the game to the Lions was sourced from a forward 50 intercept. Brisbane has scored from 64 percent of such intercepts this season (ranked third). 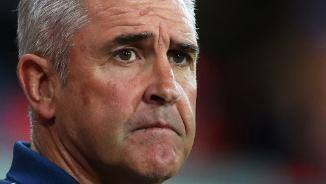 Since 2015, the Lions have lost the tackle count by eight per game against the Suns, which is the secondworst differential recorded by any team against Gold Coast in this period. The Suns have averaged only 4.33 disposals per turnover this season (ranked last), while Brisbane has averaged 5.43 disposals per turnover (ranked second). Welcome to Metricon Stadium for the Gold Coast Suns v Brisbane Lions Round 22 clash. BRISBANE has survived a huge scare, edging past Gold Coast to win by four points in a tense QClash at Metricon Stadium on Saturday night. In a fiery contest marred by some heated first-half moments, the Lions overturned a nine-point deficit in the final quarter to win 10.18 (78) to 11.8 (74). The victory is Brisbane's fifth of the season and reverses the five-point loss suffered in the clash between the teams earlier in the year. 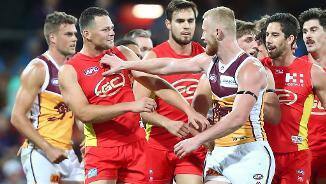 After being labelled by Lions defender Nick Robertson as "soft" in the build-up, Gold Coast was anything but in front of its home fans. They weren't clean – neither team was – but the Suns were ultra-competitive and could have easily pinched the win. Allen Christensen kicked a goal early in the final term after a dubious 50m penalty, and when Dayne Beams and Lewy Taylor followed suit, the Lions had a lead they would not relinquish. A Jarryd Lyons goal with two minutes remaining made for a nervous finish, but a Stefan Martin contested mark on the wing sealed victory. Brilliant stuff from the Lions! 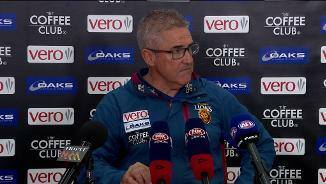 Brisbane coach Chris Fagan said it was a relief to win a close game. "From our perspective it was a grind tonight," he said. "It was good in a sense to grind away and win a game. "It didn't look good and our boys found something. 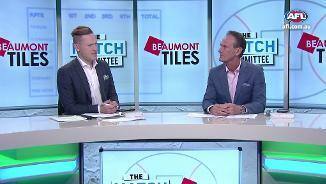 With all the close losses this year … it's good for them to get over the line in one of those games." Cam Rayner can seriously roost it! Beams was magnificent for the victors, winning the Marcus Ashcroft Medal for best afield with 38 disposals and nine clearances. It is the third time in the past four QClashes Beams has been named the game's best player. 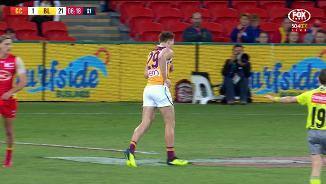 Harris Andrews also starred, controlling the backline and kicking a crucial goal on the three-quarter time siren when swung forward. After losing five games by seven points or less, the Lions finally won a close one, and had to do so without Rising Star hopeful Alex Witherden for much of the night after the young defender injured his hamstring in the first quarter. Alex Sexton was terrific in defeat, kicking four goals, while Touk Miller again kept Dayne Zorko quiet, limiting the Lions All Australian to just 17 disposals. 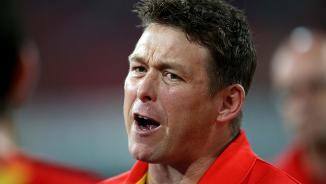 Gold Coast coach Stuart Dew said he did not reference Robertson's words in his pre-match address, but his team "put their head over the ball" all night. "I think both sides will look back and see they had chances, ours late, they had a lot of chances early," Dew said. "It's disappointing. You can't question our effort, I think our boys played hard all night and unfortunately… it would have been nice to come away with a win." 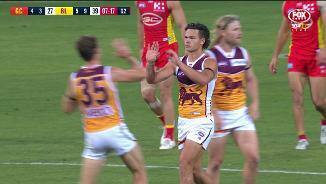 Sexton got stuck into Robertson before the first bounce and then backed up his aggression, kicking three of his goals in the first half to keep the Suns in the hunt. 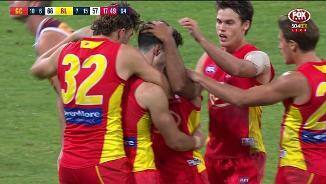 Following a mini melee at quarter-time, emotions spilled over midway through the second term when Sean Lemmens hit young Lion Brandon Starcevich late and high in a marking contest. Not surprisingly Mitch Robinson was the first man on the scene to remonstrate with Lemmens, which in turn brought players flying in from both teams. Zorko ended up on the ground via a Miller shove and when the teams settled, Gold Coast got back to playing footy and lifted their intensity. 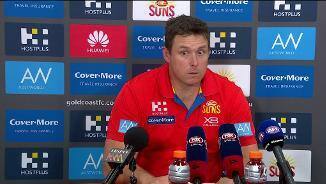 Gold Coast: After a rough year with injuries, the Suns got through unscathed in this one. Brisbane: Young defender Alex Witherden hobbled off in the first quarter with a left hamstring injury and did not return. Coach Chris Fagan said the defender would not play in the final round. Alex Witherden injured his hamstring in the first quarter. 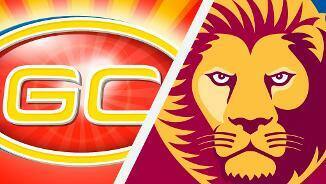 Brisbane has a tough task to finish its season, hosting West Coast at the Gabba next Sunday afternoon. Gold Coast has an even taller order, travelling to Geelong next Saturday to play a Cats team that has to win to secure their finals position.